It is not going to result in long-term sustainable production or allow the U.S. to become a net oil exporter. 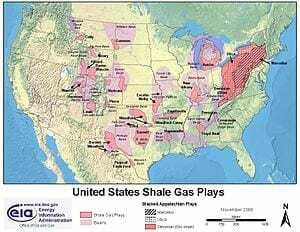 After 10 years of production, shale gas in the United States cannot be considered commercially viable, according to several scientists presenting at the Geological Society of America meeting in Denver on Monday. They argue that while the use of hydraulic fracturing and horizontal drilling for “tight oil” is an important contributor to U.S. energy supply, it is not going to result in long-term sustainable production or allow the U.S. to become a net oil exporter. Charles A.S. Hall, professor emeritus at the College of Environmental Science and Forestry, State University of New York, Syracuse, is an expert on how much energy it takes to extract energy, and therefore which natural resources offer the best energy return on investment (EROI). He will describe two studies: one of the global patterns of fossil-fuel production in the past decade, and the other of oil production patterns from the Bakken Field (the giant expanse of oil-bearing shale rock underneath North Dakota and Montana that is being produced using hydraulic fracturing). Both studies show that despite a tripling of prices and of expenditures for oil exploration and development, the production of nearly all countries has been stagnant at best and more commonly is declining — and that prices do not allow for any growth in most economies. J. David Hughes, president of the Canadian firm Global Sustainability Research Inc., echoes Hall with an analysis of the Bakken Field and the Eagle Ford Field of Texas, which together comprise more than half of U.S. tight oil production. It shows that drilling must continue at high levels, to overcome field decline rates of 40 percent per year. Shell Enters China's Shale Oil Scene With Joint Study With Sinopec - EnerCom Inc.
United States Eagle Ford Shale Oil and Gas Shale Market Analysis 2013-2018 and Outlook 2019-2023 - EnerCom Inc.
April 9, 2019 - Shell Ventures Into China's Shale Oil | OilPrice.com OilPrice.comOil supermajor Shell has signed an agreement with China's Sinopec to jointly study the potential development of shale oil in eastern China. April 11, 2019 - BP Pulls Out Of China's Shale Patch | OilPrice.com OilPrice.comPoor exploration results have led oil major BP to withdraw from the Chinese shale gas exploration game. Efficiency Stagnating in Key Shale Basins - EnerCom Inc.
April 16, 2019 - Efficiency Stagnating in Key Shale Basins EnerCom Inc.Oil & Gas 360 has released its latest Effective Rig Count, evaluating the state of drilling activity and reported production from the major shale basins.